Knowledge of React and React Native is required. Your machine should be set up for React Native development. 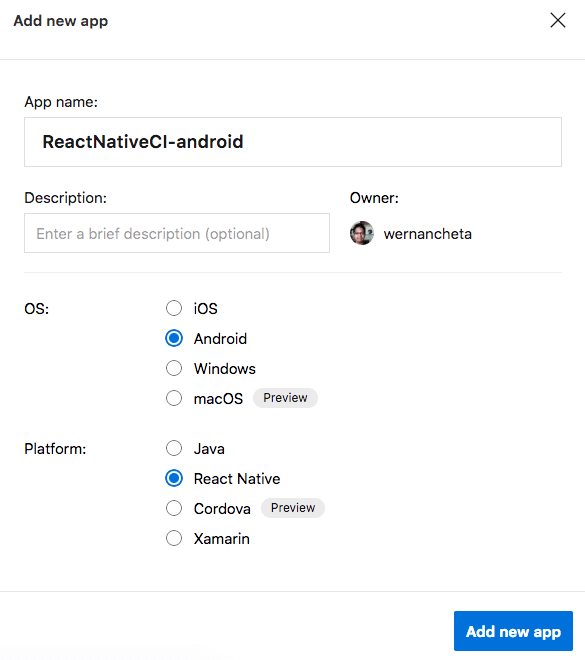 How to setup a React Native project in App Center. How to configure the project build. How to run Jest tests. How to use custom build scripts. To follow this tutorial, you need to have basic knowledge of React and React Native. Knowledge of testing tools such as Jest will be helpful but not required. We will be using Genymotion to test the builds, but you can use the Android emulator as well. Reading part one of this series is optional if you already have some background with continuous integration. For other dependencies, check out the package.json file of the project. 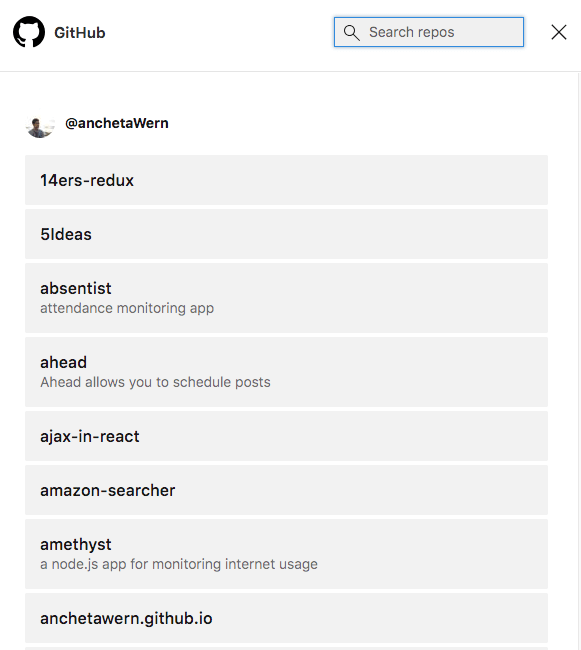 Log in to your GitHub account and create a new repo named ReactNativeCI. This is where you will be pushing the project so that you can connect it to App Center. We’re switching to the starter branch because the master branch contains the final output for the whole series. The starter branch contains the untouched version of the app that we will be working on. If you want to have a brief overview of the app that we will be working on, be sure to check out part one of this series. If you haven’t done so already, sign up for a new account on the App Center website. Once your account is created, create a new app. Don’t worry if you don’t have a Mac. App Center doesn’t need you to be on Mac in order for it to build an iOS app. The only problem is actually running the app that it’s going to build. Apple is very strict when it comes to these things. You need the app to be signed with a provisioning profile and distribution certificate from a paid Apple Developer account if you want to run it on your iOS device. 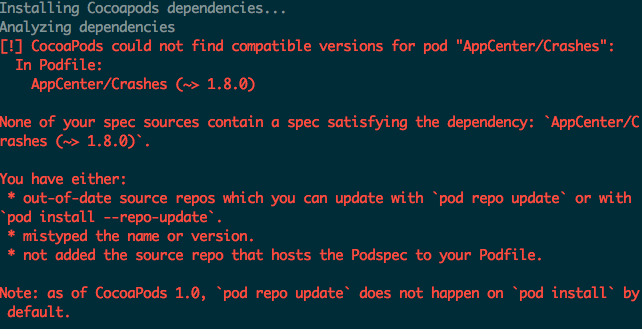 Note that if you’re working on iOS and you encounter any errors while following the steps mentioned on that page, scroll down to the Cocoapods issue in iOS section below. If you’re planning to build for both Android and iOS, you should also create the other app on App Center if you haven’t done so already. We’re setting the Build Variant to debug so we don’t have to supply a release keystore file. The Build frequency is set to manual because we don’t really want to trigger a new build everytime we push some changes to the repo as we’re just testing things out. All the toggle buttons should be set to Off for now. Note that we’re only selecting these option so we can easily get a successful build. We’ll change these options later once we make sure that there are no problems with the build. Once you’re done with the configuration, click on Save & Build. 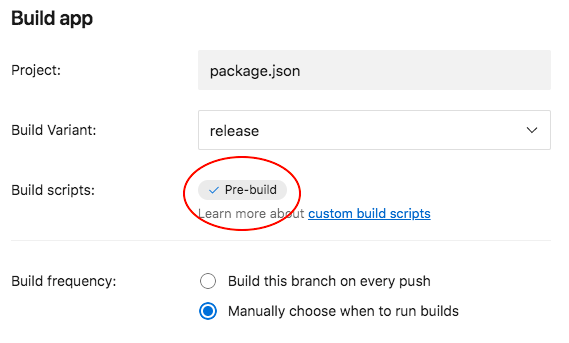 This will save your build configuration and start the build process immediately. This process might take a while. In my case, it took four minutes, so go grab a drink if you want. Once the build is complete, it should present you with a button to download the build (a .zip file containing the .apk file). But the app won’t really work because we haven’t signed it yet. All apps need to be signed with a distribution certificate, even if it’s not going to be released on any app store. The only purpose of having you build is to make sure that the build succeeds and to get you acquainted with the App Center. 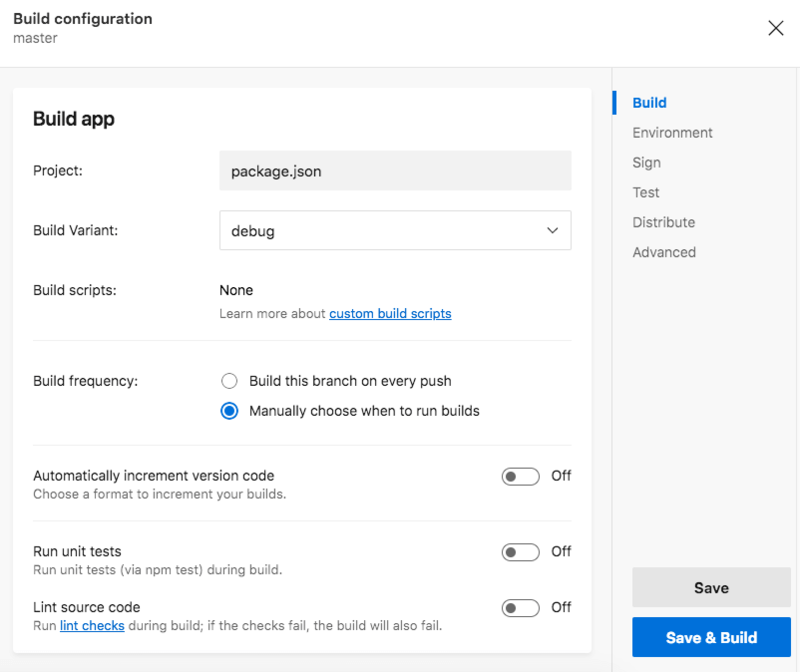 To get you acquainted with the whole continuous integration process, we’ll be adding a minor update to the app. If you’re not familiar with Git workflows or branching models, be sure to read up on them. You can also check out the CI workflow in React Native section in the first part of this series, as we will be following the workflow mentioned there. Add a margin at the bottom of the card list. Make the target area of the favorite button bigger. git commit -m "add bottom margin to CardList"
After that, delete the src/components/IconButton.js file because it’s no longer needed. At this point, you can now test the app to see if it’s still working. git commit -m "make favorite button's target area larger"
Note that when pushing changes to your repo, you have to commit both android and ios directories as well. This way, App Center is able to run the build commands for both Android and iOS. The rest of the toggle buttons should be set to Off. If you’re on Windows, you might not have the keytool in your path. You can usually find it in the C:\Program Files\Java\jdkx.x.x_x\bin directory. You can either add that path to your environment path or just open a new command line window inside that directory and execute the command above. You can find more information about this on the documentation for Generating Signed APK. 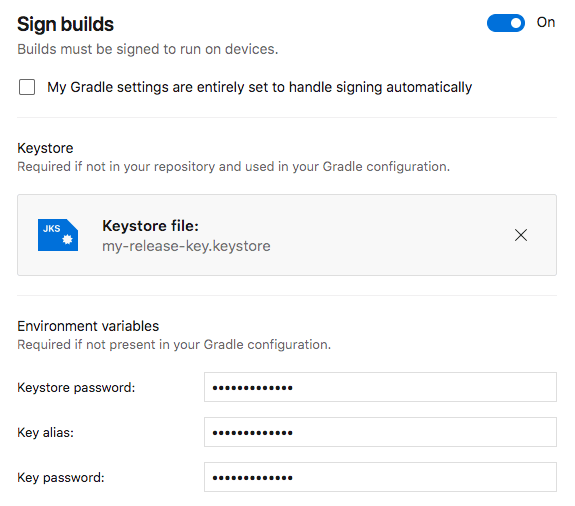 Once the keystore file is generated, upload it to App Center and enter the keystore password, key alias, and key password. 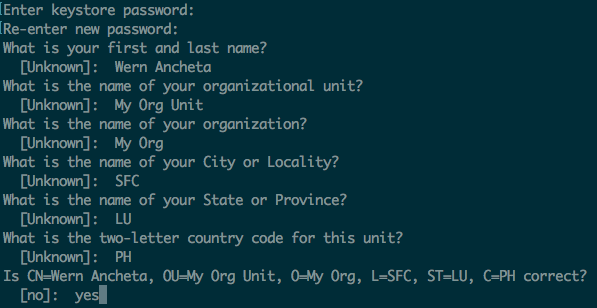 If you used the exact same command to generate the keystore file, the key alias is my-key-alias. And if you used the same password as your keystore password for the key password, then enter the same value for both. Once that’s done click on the Save & Build button to start the build. Once the build succeeds, you should be able to downlod, extract and drag it over to Genymotion. Since the .apk file is now signed, you should be able to run it without problems. If you’re configuring the build settings for iOS, I hate to break the bad news but you won’t be able to install or run the resulting .ipa file if you’re not an Apple Developer Program member (the one which you have to pay 99 USD per year). You can still have a free provisioning profile and certificate if you have a free developer account. But if you’re planning to distribute your app for beta testing with TestFlight or TestFairy, you’re still out of luck because only provisioning profiles and certificates from a paid Apple developer account will work. That means that apps signed with a certificate from a free developer account won’t work. For those of you who are not a member of the Apple Developer program, the only thing you’ll get out of using App Center is making sure that the iOS app builds successfully. post-clone - executed right after your code repo has been cloned. pre-build - executed right before App Center begins the build process for your app. This is usually right after the dependencies for your project are installed. post-build - executed right after your app is built. Execute post-clone scripts (if you have one). Execute pre-build scripts (if you have one). Build the app (react-native run-android or react-native run-ios). Execute post-build scripts (if you have one). There’s also code linting, but that’s mainly for native Android development, so I didn’t include it in the steps above. In our case, all we want to do is update the app snapshot for valid changes that we make. But how can we tell App Center that we want to update the snapshots? Well, the simplest way of implementing these kinds of checks is through environment variables. Each build can have their own environment variable so it’s the perfect place to put these kinds of custom config. To add an environment variable, click on the gear icon of the branch you want to configure. In this case, we want to configure the develop branch. Note that you have to set this value to false (or any value that’s not true) if you didn’t make any change to the component tree (for example: updating the styles, removing or adding a prop, removing or adding a component). Otherwise, snapshot testing will be pointless. I realize that this can be inefficient and prone to mistakes, but I can’t really find any other solution to this one. echo "MY CUSTOM PRE-BUILD SCRIPT..."
echo "Now updating the snapshots..."
echo "Done updating the snapshots"
What this does is check whether the value of UPDATE_JEST_SNAPSHOTS that we’ve set on App Center earlier is true. If it does, we execute the code for updating the snapshots. That way, by the time it gets to running the actual test (if you have enabled it in the build configuration), it won’t fail. 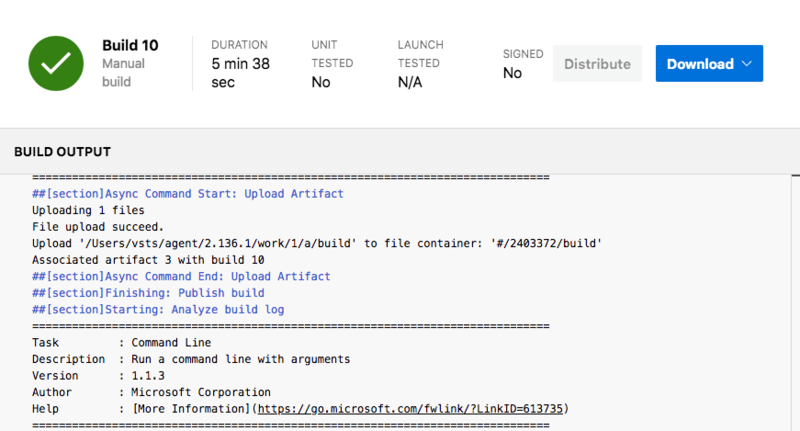 Note that even if the build succeeded, and your tests didn’t, the build is still labeled as “failed”. git commit -m "add pre-build script"
Once you see that, you should be fairly confident that the script will be executed on your next build. That’s it! 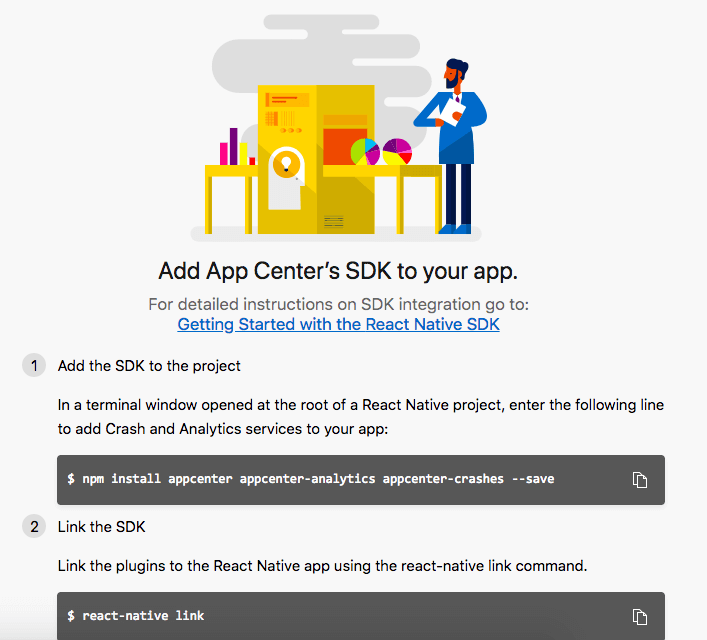 In this tutorial, you learned how to use App Center to easily setup continuous integration for a React Native app. Specifically, you learned how to build and test the app using App Center. You also learned how to use a custom build script to update the Jest snapshots. 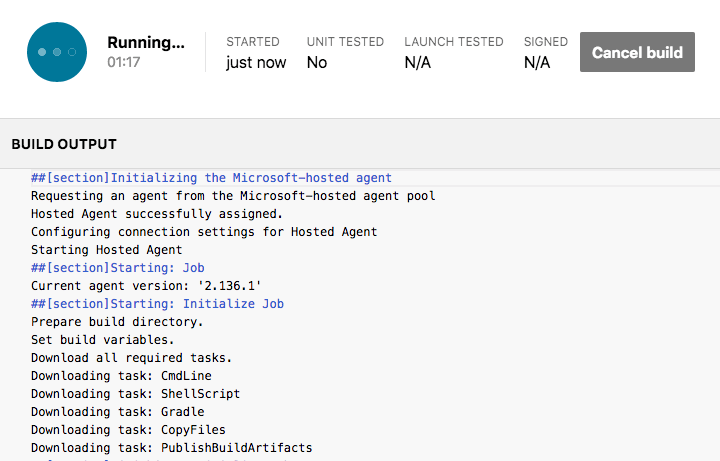 App Center is great if you’re just getting started with continuous integration. But as soon as your needs grow, you’ll need a more customizable and powerful solution. So stay tuned for part three where we will use Bitrise as the CI service for the app. You can find the source code used in this tutorial on its GitHub repo. Don’t forget to switch to the part2 branch for the final output of this part.